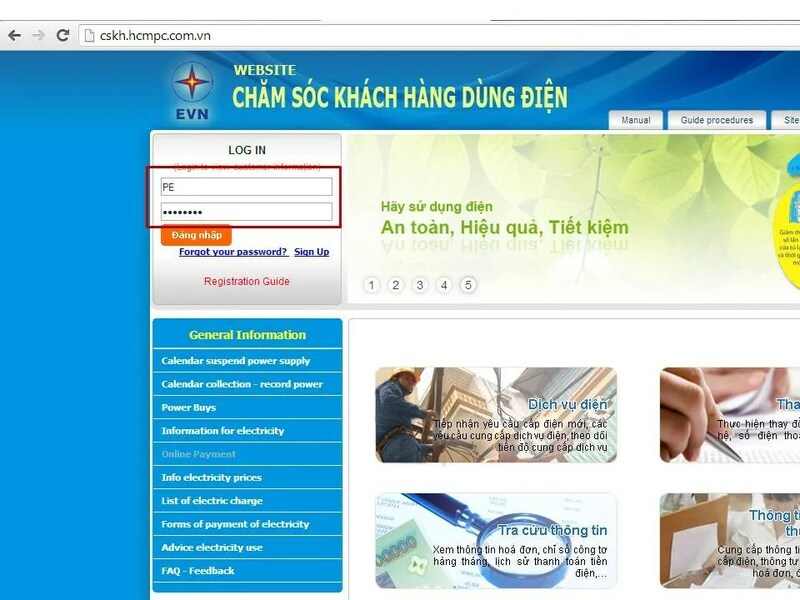 EVN Electricity Bill Online | Hello Saigon! I don’t like opening my mailbox full of bills BUT you can hardly ignore ’em. The cable company doesn’t send billing statements anymore and you’d just see a reminder on your TV screen when you open it telling you your bill is due in x number of days. The nice thing about it is you can pay however many months you want so you don’t have to keep coming back to their service center to pay. Last month, an agent friend sent me a message telling me that EVN (electricity company) will no longer send out billing statements starting this month. We are to check our statements online and pay via bank or whatever form is convenient. Yay? Well, I’m all for reducing carbon footprint but unfortunately, the EVN website is not in English. Even my Google Chrome auto translate doesn’t work all the time. STEP 1: So anyway what you do is get your old billing statements and get your customer number which is MA KHACH HANG in Vietnamese. See above photo where I boxed the information in red. It starts with “PE”. STEP 2: Then you enter that information in the Log-In and the default password is cmis2012 — I’m pretty sure you can change this. You will then of course be able to view your Customer Information. 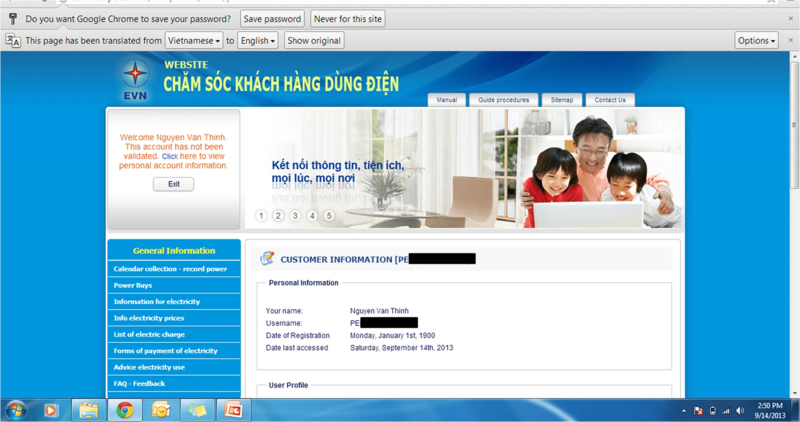 STEP 3: Click on Payment Information found at the bottom of the Customer Information column. You will be shown the page with the amount you shall be paying. I’m not sure if EVN will push through with this but it’s the 14th and normally, we receive the billing statement today which is due 5 days after — so that’ll be the 19th. It’s no fun getting your electricity cut. Even if we’d still be getting our billing statements in the mailbox, this is sure good to know in case you misplace the paper. 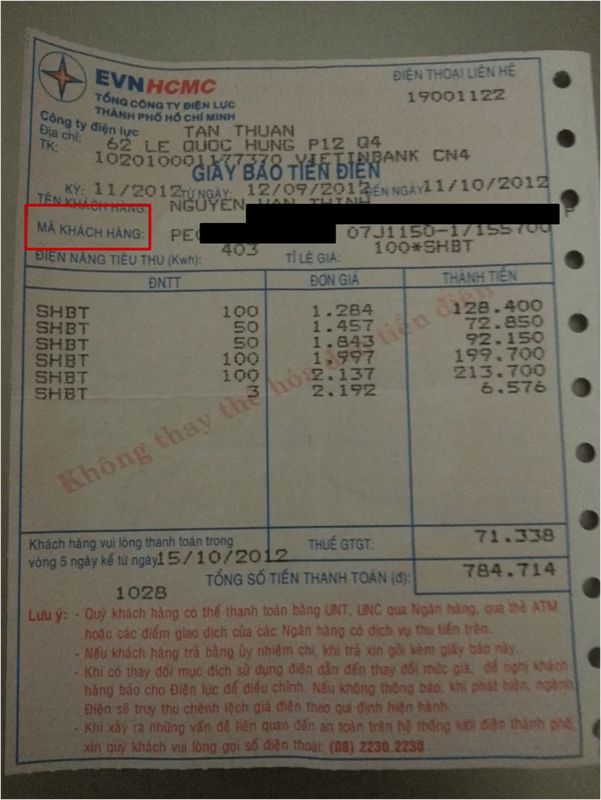 This entry was posted in Sharing Saigon, Spills and tagged electricity bill, EVN, Ho Chi Minh City, Saigon, Vietnam. Bookmark the permalink. Gosh. That’s useful. An oddly interesting post. Thanks. Useful when I relocate from London in 2014. Great. Good to know, although we got ours for this month last week, so maybe it starts next month. In any case, this is something I would not have known about, so my wife and I greatly appreciate the post! Will check my mailbox again! Getting the bill is more convenient so I don’t have to fill out forms at the bank anymore. It will be interesting to see how poorer citizens will be able to see their ‘on-line’ account using a feature cell handset rather than a smartphone. Additionally, some people require an INVOICE and a RECEIPT with a VAT number on it so they can claim it against their VAT tax account. I, alone, in a Q7 apartment during the week (my home wife wife and daughter are elsewhere) and use around 250 kilowatt hours monthly. There are many families who use under 100 kilowatt hours a month – couldn’t believe it. One of my students has his parents, himself and his brother and wife living in ONE HOUSE and a BILL UNDER D100,000! There are several TV cable companies (PMH has their own) in TP HCM. Soon there will be much, much fewer as they are being forced to amalgamate. (HD TV coming soon, too) I have never, ever received a bill from my cable company. A couple of years ago when things went bad in the (new) building wiring we decided to hook up to a house over the back fence. People toss the house owner D10,000 a month and he seems very happy! 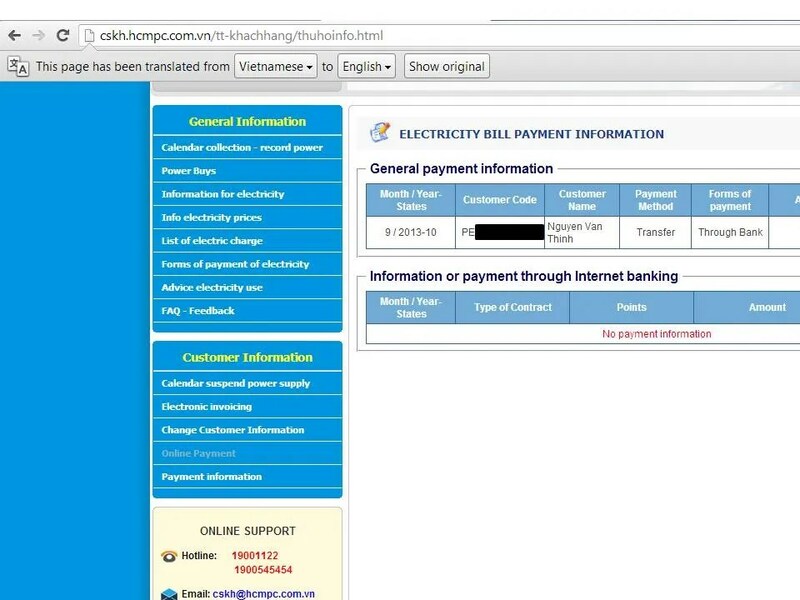 Pingback: EVN Electricity Bill New Look | Hello Saigon! here is the solution for paying the tneb online payment through online.